What image comes to your mind when you hear the word brave? Do you picture a solider going into battle? Perhaps a fireman rushing into a burning building? Do you picture a person who looks ordinary in every way? Typically we view bravery only as big acts of courage, but that is not the only way people are brave. The idea of being brave is something that my husband and I are trying to teach our kids. My oldest daughter Isabella is struggling with the idea that she can be brave. She sees bravery as someone who isn't afraid and she's pretty convinced that only grown ups can be brave. I need her to learn that she can be brave. 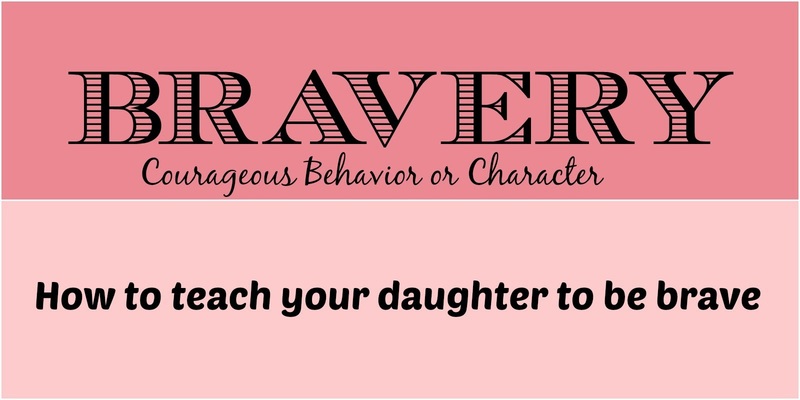 Here are some of the ways I'm teaching my daughter to be brave. I tell my daughter that the bravest thing a person can do is be their authentic self. I'm urging her to be the person she was created to be instead of acting like someone else. I'm starting this conversation young hoping if she always hears it, she will believe it once peer pressure begins. Honestly, being her authentic self is my main focus on our bravery talks. My husband describes her as endearingly quirky. I love that description! She is her own little person and I love it. I love that she dresses in a way that makes her happy instead of what is in style. I love that she has a vivid imagination and plays make believe games. I hope she never changes. I tell my daughter that being brave isn't the absence of fear. It's trying new things even if you're afraid. For example my kids went to VBS where my twins knew some of the kids, but Isabella did not. She didn't want to go since she didn't know anyone. So we talked about being brave and how she can make friends before the week began. When we walked in, I could see that she was nervous but she went right in and sat down with her group. She made a friend that first day and she is having a great time. I give my daughter examples of when I have been brave. I want her to know that I struggle with bravery and that it's OK. Being brave is a struggle at any age. I want her to know that it's hard for me too and learn how I handled the situation. My hope for my children is that they will grow up with more confidence than I had. I want them to be brave enough to be their authentic self. I know that my husband and I have to lead by example on bravery and that this conversation will continue as they gets older. What are some of the ways that you are teaching your children to be brave?